Jill Ellen Stein (born May 14, 1950) is an American physician specializing in Internal Medicine. 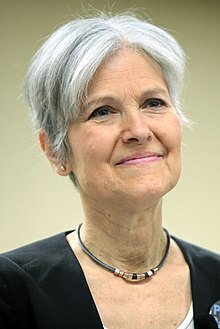 She was the nominee of the Green Party for President of the United States in the 2012 election. Stein was a candidate for Governor of Massachusetts in the 2002 and the 2010 elections for Massachusetts. She announced that she will once again run for the Green Party nomination for President in the 2016 U.S. presidential elections. ↑ "Mass. doctor Jill Stein wins Green Party's presidential nod". USA Today. Associated Press. July 14, 2012. Retrieved July 15, 2012. ↑ Levenson, Michael (October 24, 2011). "Jill Stein launches bid for Green Party presidential nomination". Boston Globe. Retrieved 24 October 2011. ↑ O’Sullivan, Jim (January 7, 2010). "Stein to jump into gov race with Green-Rainbow bid". Boston Globe. Retrieved July 18, 2012. ↑ "Wayland's Jill Stein to launch campaign for governor". MetroWest Daily News. Boston. February 4, 2010. Retrieved September 6, 2012. This page was last changed on 22 April 2019, at 16:32.